Take a Ride on Santa’s Sleigh! 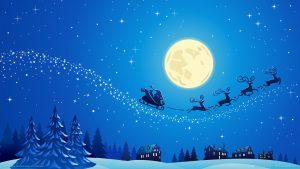 Imagine it: there you are in the dark of a snowy, cold winter’s night, the wind flowing through your hair — you’re on Santa’s Sleigh! The reindeer, the jingling of bells, the Ho-ho-ho! of your traveling companion, the great Santa Claus himself! You have a front seat to his magic, his wonder, and his powerful gift of giving that makes millions merry across the world. To do that you need to know his secret. His secret is that he just gives. It is not important who he is, where he is from or even what he looks like. He does not want to be known — he only wants to serve others and make them happy. He just gives — and that is all that matters. Santa gives where there are needs. He gives because he loves. He gives because he wants people to be happy. He gives so that at least for one brief day people might feel loved, inspired and willing to give of themselves to others. Wouldn’t it be great to be just like Santa? That is our mission. That is what we do. We give anonymously — together. No one knows who we are and we just do not care. What is important is that we give.